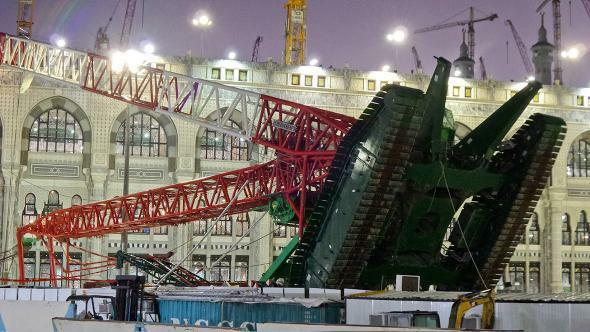 Mecca crane collapse: Grand Mosque site of disaster. 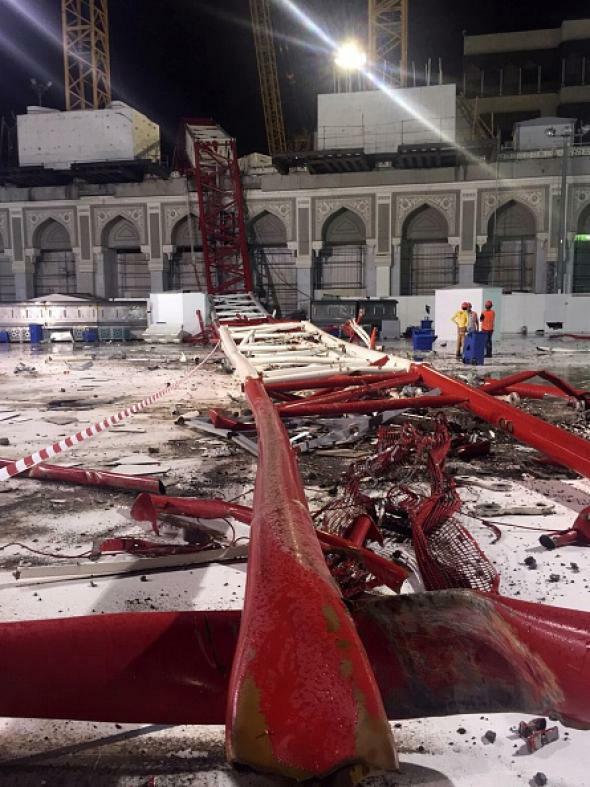 Base of a crane where storms caused a crane to fall in Mecca’s Grand Mosque on Friday, September 11, 2015. The collapsed crane in the Grand Mosque. Update, 3:45 p.m.: Per Saudi officials, at least 87 people were killed and 184 injured in the collapse. Original post, 1:15 p.m.: A verified Twitter account run by the Saudi Arabian government says that 62 people have been killed and 30 injured in what appears to have been a crane collapse at the Grand Mosque in Mecca. A number of other tweets appear to show the bloody aftermath of a large accident at the mosque, which surrounds the Kaaba, Islam’s holiest site. New construction projects are very common in Mecca, which is controlled by Saudi interests that celebrate ostentatious materialism (the mosque is overlooked by a 1,972-foot skyscraper) and hold the religious belief that historic sites promote idolatry. Much of the construction is performed by the Saudi Binladin Group.